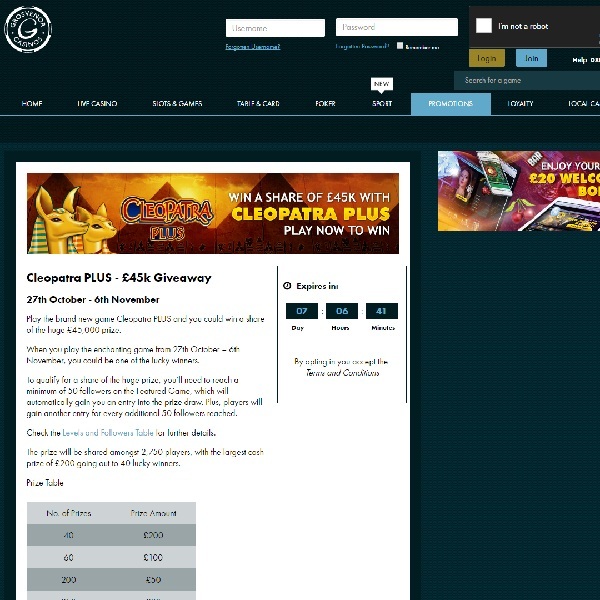 Over the next week Grosvenor Casino is running a Cleopatra Plus £45,000 Giveaway to celebrate the launch of the new game. All you have to do is visit the casino and play the game between now and November 6th. To qualify for a share of the prize you need to reach a minimum of 50 followers on the Feature Game. You will gain another entry to the prize draw for every additional 50 followers that you gain. The prize fund will be shared across 2,750 players. The top prize of £200 will go to 40 players, there are 60 prizes of £100, 200 prizes of £50, 250 prizes of £20, 1000 prizes of £10 and 1,200 prizes of £5. Head over to Grosvenor Casino today and start playing this exciting new game for your chance to share in the prize fund.